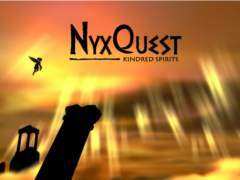 Over the Top Games was kind enough to send me a review code of NyxQuest: Kindred Spirits for PC. I dropped the code into Steam, (my preferred digital distribution PC store) and 130-ish MBs later, I was playing. I’m a real big fan of lean games. Low requirements for entry, yet that doesn’t mean the game can’t benefit from more horsepower. I ran the game on two setups, both with AMD/ATi graphics cards. My main gaming rig is a Q6600 running at 3Ghz, 8GB of DDR2 ram and an HD5870. This is the machine which I use to record the video at 1080p and you can really see how nice the game can look. The other machine I ran it on was a Quad Core AMD CPU running at 2.4 GHz with 4GB of DDR2 Ram and integrated HD3200 ATI card. 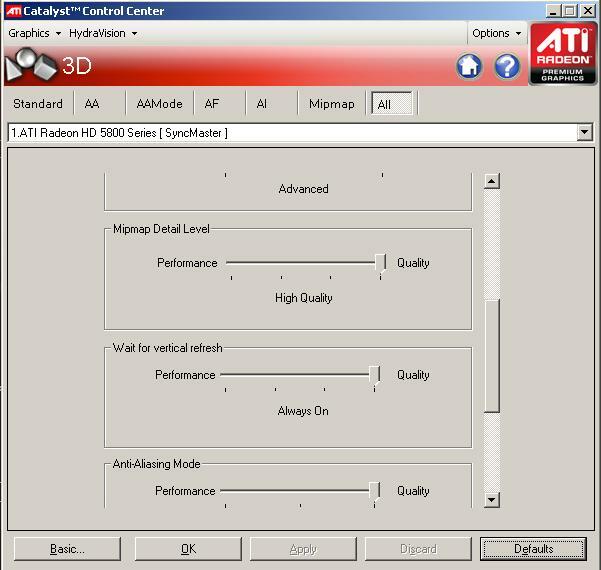 The problem with the ATI integrated solution is the vram is shared and only uses it on a 32-bit bus. The GPU is capable of doing more, but it’s basically starving because the RAM isn’t feeding it fast enough. Regardless, on this integrated solution, I was able to run the game perfectly at 1280×720 resolution. Graphically, NyxQuest displays itself very well. It’s not competing with today’s graphically demanding games, but the developers didn’t get lazy either. Also considering that this game was first produced as a wiiware title whose max resolution is 720×480 (when using component cables), it translates very well at 1080p. As a matter of fact, the only noticeable visual anomaly I experienced was some screen tearing. But I don’t think it was the game’s fault entirely. When I set Vsync on, it didn’t seem like it was actually active. So, when I went to the ATi control panel, I just forced Vsync to always be on and that took care of the problem. Again, this could have just been a driver issue on my end. 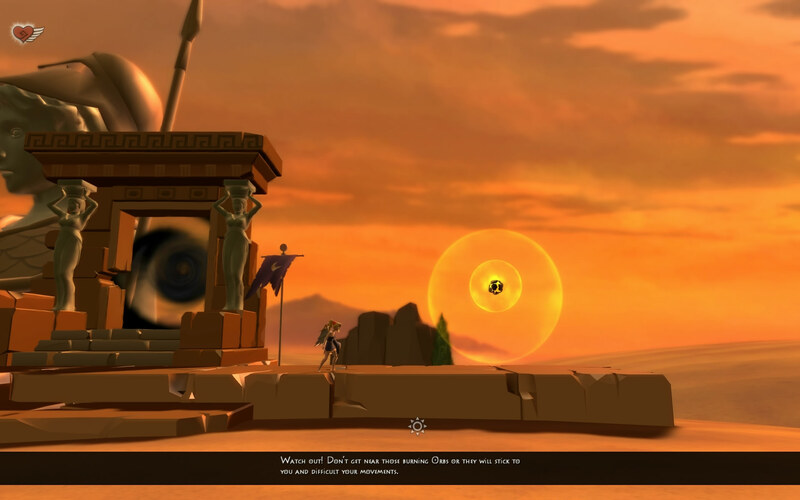 While most of the game is showcased with an arid desert setting using similar textures, particle effect animations are used quite extensively to highlight the direction of the game. Fireballs, wind patterns, gushing sand and shadow smoke coalesce into this moving tapestry type of way. I guess you could pretty much sum up the art direction with the following statement, “Simple, yet effective.” I never once wondered where I was supposed to go. 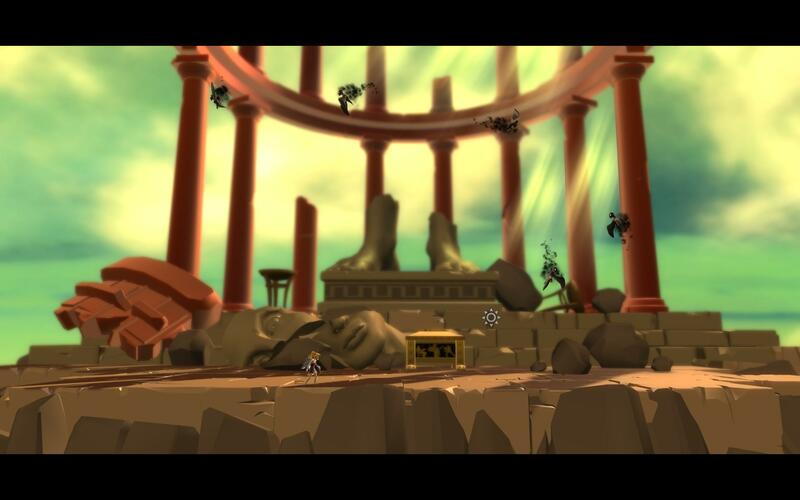 From movable blocks to hazardous areas, everything in NyxQuest directs your eyes to what is your current objective. I think it is this simplicity to design that really helped cinch the gameplay into something that just “clicked” with me. The meat and potatoes. This is something I am going to really enjoy to try and explain because it’s the first instance I’ve played a game that used this mechanic. It’s like this: when you were a kid, did you ever have a chance to try to “draw a square with your left hand and draw a circle with your right hand” simultaneously. It takes a little doing to get going and usually whenever I try to speed up my action, the more my hands start to blend the same action. Kinda like tongue twisters, the faster you try to say it, the more it just comes out like one syllable. Try it. Say “ToyBoat” ten times fast. One of those times it’s going to come out like toytbo. Now I know what you’re saying, “Phawx, what the hell are you talking about! ?” and I’m here to tell you what I’m talking about. NyxQuest is like playing two games at the same time. The genre for the game might be a puzzle platformer. But you play the platforming part with your left hand and you play the puzzle part with your right hand. Think about that for a second. Let that soak in. Did it soak in yet? Yea. NyxQuest will put the right hemisphere of your brain in a headlock while the left side of your brain is trapped in a full nelson. 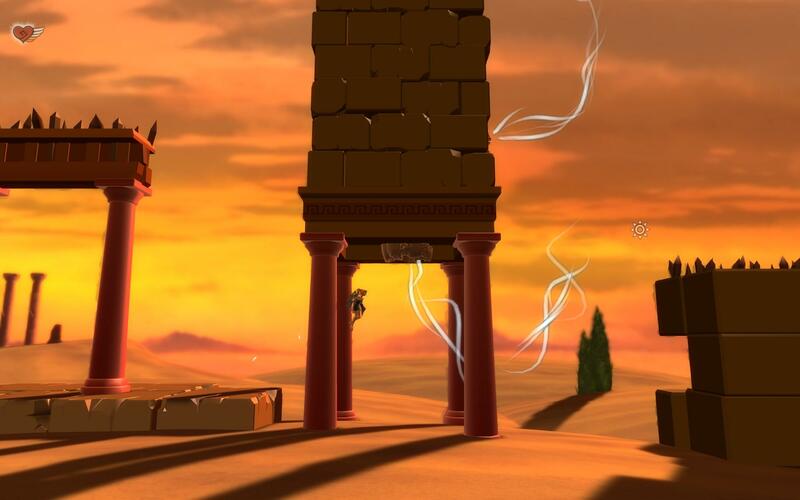 There are certain parts in NyxQuest where you need to successfully navigate Nyx without getting crushed while controlling a fireball and praying it doesn’t touch any walls or get blown out by the wind. Or trying to stay a top a moving platform while directing wind in different directions to make sure you’re not blown to kingdom come. It’s this unique play style, and please comment if I’m wrong, that really makes the game shine. It’s honestly the first instance where I played a game like this. NyxQuest manages to soak up a simple premise and wring out all the nonsense so all you’re left with is a pure concept to play. Please check out the video review because words can’t do it justice alone. Sound and music is always a difficult one for me to explain. It’s the type of thing where in it’s absence, you understand it’s importance. Voices are conveyed by this slow mystic chant as text scrolls by. A lot of games use this technique to keep file size down and to avoid bad voice acting that can crop up in games. It also has to help with localizations, because you only need to change the text. Which is something I need to bring up, because in one instance the grammar isn’t actually correct. But that was the only particular instance where I found something wrong like that. Before I move past sounds, I want to make the point that they aren’t bad. They just aren’t great either. The sound effects are just enough to feel like the game is complete. Everything that needs to have a sound effect, does so and it’s accurate. Crashing vases, squawking birds, flame rustling through the air. It’s all there. Which leads me to the music. There is definitely moods that are triggered by certain music in the game. You have environmental music to emphasize the exploration aspect of the game and you have some fast tempo music when the puzzle platforming gets a little crazier. The sound gets a B+. It’s complete and focused. However, for me, nothing really stood out. The sound and music in NyxQuest manages to be just good enough that you don’t realize anything is wrong. This is another area for NyxQuest that I feel is kind of ancillary to the main objective of the game. The story is set in Greek mythology. The introduction tells the story of Icarus who made a set of wings so that he could fly. And he used them to fly to the city above the clouds. When he gets to Olympus, he meets and falls in love with the Goddess of the Night, Nyx. Icarus returns to earth. Helios, for reasons humans believe, is tired of the creation of man and wants to start over and begins to heat up the Earth which leads to humans dying. Icarus then wants to travel back to Olympus to find out why this is happening, but the Sun is too hot and melts the wax on his wings and he plummets to the Earth. Nyx realizing this decides to travel to the ground to rescue Icarus. Along your way, different Gods grant you new abilities. such as, controlling fire and wind to help you along your path. Now, I’m not up on my Greek mythology, but I don’t recall any of this going down like that. I always knew it as Icarus being a fool and flew too close to the sun and then it melted the wax of his wings, not because Helios was trying to kill all humans. But, this is how the story goes in NyxQuest. There is nothing fundamentally bad about the story. It exists. There is a plot. You have a reason to be doing what you are doing. That’s it. NyxQuest is a fantastic example that if you really nail gameplay down, you have yourself a good game. 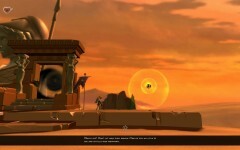 The innovative gameplay matched with the narrative visuals form the core of what is a solid title. 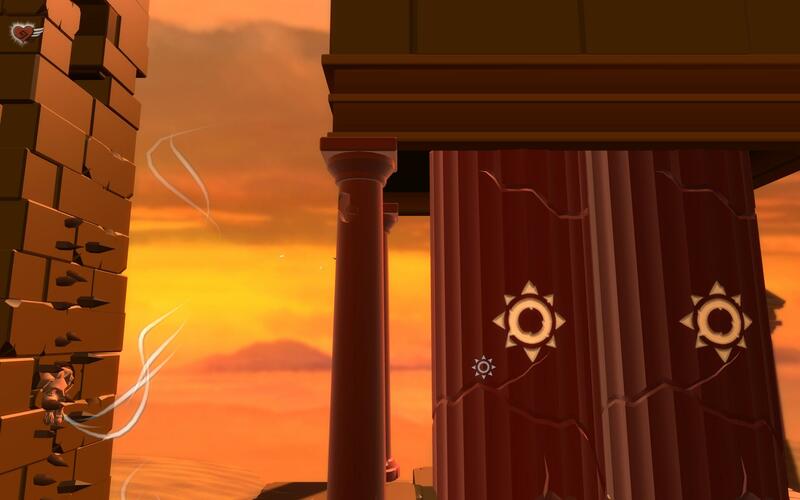 While the sound and story are just so-so, the elements are good enough to further strengthen the frame of the game. And to top everything off the game is only $10. The price is right, in my opinion. The game is a little on the short side, but if you go for all the achievements in Steam, you can expect to boost playtime. For some odd reason, I didn’t get any of the time challenges on any of the levels, yet I managed to get a time challenge on one of the hardest levels, lvl 12. You owe it to yourself, at the very least, to try a demo of the game. 8.5 / 10. A Unique Puzzle Platformer that needs to be experienced.